Student placement requests tend to be seasonal. Do not limit your contacts with your clinical partners to when you need rotations. Your partners are likely to be already flooded with requests. The schools and colleges who have already built a relationship with the hospital educators throughout the year are most likely to be considered for clinical placements. Host meet and greet events at a local popular venues. Invite your clinical partners in the hospitals to become members of, and contribute to your advisory board. Host periodic advisory board meetings and dinners with your members. These meetings should be held at nice venues and should be something to look forward to. Give importance to your clinical partners’ input and act on it. Coach your students so they understand that clinical rotations are a bridge between school and real work. Depending on the clinical setting, some hospital educators expect your students to do actual work and add value to the hospital. 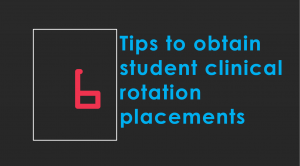 Make sure your students understand that clinical rotations may not be a passive class, and that they should stand ready to help if asked to do so. Hospital educators have reported that they actually favor students who perform actual work and help the best they can during their clinical rotation experience. Instructors reflect your school’s reputation. They have to be coached on your expectations. For example, being on time, supervising at all times, make sure students have IDs and not congregating in public places. Find someone with relationships at the corporate offices of the hospital chains. Visit not only clinical coordinators, but make sure also CEOs and CNOs are regularly visited. Your clinical partners at the hospitals have to manage multiple times more students than each individual school does, for what regards rotations. Save your colleagues a headache: make sure student paperwork is compliant for rotations. Utilize tools to manage rotations and student compliance, such as www.rotationmanager.com, which also generate reports the reports your clinical partners need for their audits at the hospital.